When your key breaks off in your lock with that stomach curdling snap, feelings of dread and helplessness descend over the scene. Some optimism for a moment. “I can still open this door at least.” STOP! Before you do anything, make sure you have read this entire post. Out of all six of these steps, there will be the one best way to remove your broken key. The best way will depend on your exact situation. Where are you? What tools do you have? How deeply is the broken key inserted? Once you have found the method that you are able to use, do not be stressed by your inability to get the broken key out of the lock on your first try. Most of these methods require a bit of repetition. But how fitting is it that it should be so easy to break something, and so much harder to fix it. I would recommend basking in the poetic irony of life at any time that you feel stressed or pressured. Good luck! Many people think that even if their key is broken in the lock, the lock should still open by inserting the rest of the key. Do not try this. By trying to reinsert your key, you will push the broken part of the blade further into the lock. All of these methods will work some much easier and faster the shallower the key is inserted. The farther back the key is, the more struggle you are going to have. Depending on how deep you force the key into the lock, some of these methods might not work. Put the part of the broken key that you have, down, or in your pocket. There is no need to use this piece. However, you should not get rid of it. Hold on to your half so that you can give both parts to your locksmith or your local hardware store. With both pieces of your key, a locksmith can cut a new key. This preparation is optional, but it will make the process easier. Begin by applying a lubricant to the keyway. The lubricant should ideally use graphite spray lubricant or some other form of dry lubrication. Oil-based lubricants, such as standard WD-40 will work, but they can gum up the internals of the lock. After a short bit of time, there may be some trouble with the smoothness of the plug rotation. The only issue with a graphite spray is that it will stain things very easily. Make sure that you have lined up the nozzle of the lubricant so that it is inside the keyway before you spray. You will also need a rag or paper towel to remove any of the excess lube that spills out of the keyway. Also, grab a pair of needle nose pliers, because even though these methods will remove the broken key, pliers will help to get it out that much faster. Once enough of the key is accessible, you can just pull it free with your pliers. In a high-stress situation, it can be difficult to take inventory of the things we have on our person. When you are reading about thin metal or matches, it is understandable that extrapolation of similar materials may be difficult. So here are some things you may have on your person, or around you, that will help to get your key out of the lock. When a key breaks off in the lock, most people go right for the tweezers. Your main concerns should be the thickness of your tweezers and how far the broken key is in the lock. Most tweezers are inappropriately sized for this task and will just end up pushing the key farther into the keyway. Make sure that your tweezers can open wide enough to fit around the key, but not so thick that they cannot fit along the sides of the key. Due to the warding on most keyways, your average tweezers are not going to fit. Getting a broken key out of a lock with tweezers will work best if there is a bit of the key protruding from the keyhole. When the key is too far back, the chances of you pushing it deeper in increase exponentially. We all love the game “Operation”, but sometimes life is more than just a game. Only attempt this method if you are extremely confident in your ability, and your tweezers. A broken key extractor tool is the professional solution to this problem. If the locksmith you call does not make their own tools (and chances are they do not), then this will be the tool they use. To use this tool place it inside the keyway along the bitting of the key. To clarify further, you will be trying to hook the teeth on the key with the hook(s) on the extractor. Once placed along the biting, turn and pull, and this should grab and remove the key. Of course, this may take several attempts. If you are looking to purchase a broken key extractor I would warn you that much like purchasing lock picks, these tools come in sets that include unnecessary variations. I see some people use a single hooked key extractor, and others use a double hooked key extractor (myself included). Other than that, the other profiles are extraneous. So if you can, save some money and get one or two of these. If you don’t want to buy a specialty broken key extractor, you can make one yourself out of a small jigsaw blade. (This will also work with mini hacksaw blades.) What you want is a thin piece of metal that will be able to fit in your keyway along with your broken key, so the smaller the better. If needed, break the blade with some needle nose pliers so that you can insert the serrated edge into the lock. If the serrations on your blade are on an angle, place the blade in the keyway so that the serrations are pointing back toward you. This will allow the blade to go in easier, and hook the key easier. You can use this similar to the broken key extractor by lining up the serrations on the blade with the bitting on the key. With a turn and a pull, your broken key should be out. If the key does not come out on your first attempt, then simply try again. This method is perfect when you have some blades lying around, or still have the means to travel to a hardware store. Using super glue to unjam a lock seems a bit counter intuitive. It is also one of the methods I see fail quite often. Though if you are really in a bind and have these supplies, it is an option. The idea is to glue the key to something like a match, so it can be pulled free. First off, if your key is pushed back far into the keyway and there is no metal visible, do not try this. The super glue trick works best when the broken key is accessible. Take a small wire or a match and place some super glue on the end of it. Before getting this near the keyway, remove any excess glue or add glue if there is not enough. Too much glue may harm the lock. Not enough will keep the glue from sticking. Hold that match/wire against the edge of the broken key. When you are applying pressure be sure that you are not pushing the broken key further into the lock. Wait the recommended time for the substances to bind and then pull your match away from the lock as if it were the bow of the key. In order to tap the cylinder, you must be able to point the keyway down toward the ground. If you have a padlock or are able to remove a cylinder, this method may work for you. While the lock is positioned with the keyhole facing down, strike the lock with a hammer. If you could strike a solid surface by slamming the cylinder, this would be ideal. I would recommend striking the keyway side of the lock over striking the back of the lock, but if this is going to work it should work either way. The trick to this method is to keep the lock still, so that gravity can pull the broken key loose. This method will rarely be an option, but when it is, there are very few specialty tools required. 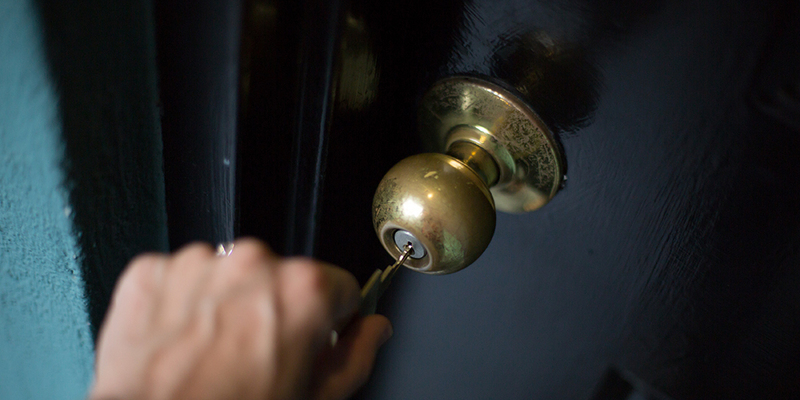 If in completing this method you have excessively struck the lock, consider having a locksmith repair the lock core. If there is damage to the lock core, then this will create further hassles down the line. With two thin pieces of metal, you can probe the keyway and pull out the key. Line up a piece of metal on both sides of the key. When I say both sides I am talking about the sides that interact with the warding on the lock, not the biting and smooth side. You do not have to put your tools in very far. Just place them in enough to be able to apply pressure firmly. Then pull the broken key towards you. This will probably only move the key out a bit. From there, apply the technique again, and you will get the key out bit by bit. Other than pulling you may also try prying out the broken key. While both pieces of metal are in the keyway, turn your wrists inward, almost sliding the key out. If you are skilled in the various methods of lock picking, or have lock picks on your person, these can be the perfect tools for the job. Make sure that the picks you use do not have a great deal of value to you because chances are that they will be bent slightly by this process. Between all of these methods, you should be able to get a broken key out of any lock. No matter the lock type or object they are attached to, as long as you have the right materials, it should be no problem. Just make sure that you take your time. Rushing these processes is a sure-fire way to turn a bad situation into a horrible ordeal. Slowing down is often the best way to save time. Never rush when you’re in a hurry. That is how accidents happen. Most people are going to freak out in this type of situation. Not you. You are going to get calmer than you had been even before this happened. Nothing matters except keeping your wits about you. Forget about your appointment. You can reschedule. Call your office and tell them that you will be late. If you get there on time you lose nothing. You can do this. You can do anything! There is nothing you can’t do! Now get that broken key out of that lock.